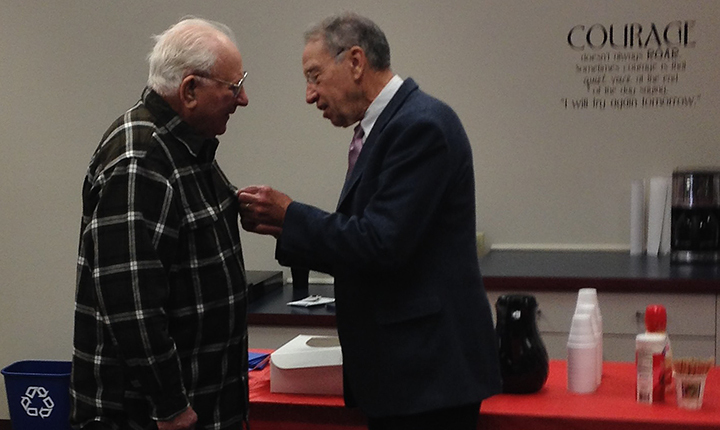 Monday, U.S. Sen. Chuck Grassley presented the Prisoner of War Medal to Mr. Raymond Pearl Cooper, of Goldfield at the Wright County Veterans Affairs Office. Cooper served in the U.S. Navy and was a POW for two years in Korea. However, his discharge papers did not reflect that he was a POW, and the medal was never presented. Sen. Tom Harkin began work on Cooper’s case and after Harkin’s retirement, Grassley took the case over. Through the U.S. Department of the Army, which handles medals, Cooper received his POW medal. 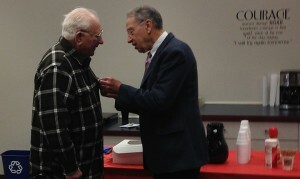 Other veterans were also in attendance as Cooper was awarded the medal.